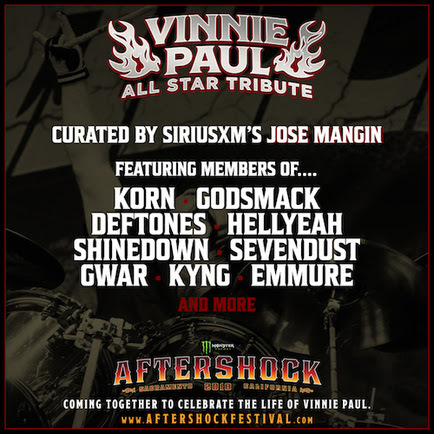 Members of KORN, GODSMACK, HELLYEAH, DEFTONES, SHINEDOWN and SEVENDUST are among the musicians who took part in a special tribute to late PANTERA and HELLYEAH drummer Vinnie Paul Abbott on Saturday, October 13 at the Aftershock festival in Sacramento, California. Fan-filmed video footage of the performance can be seen below. Vinnie Paul died on June 22 of dilated cardiomyopathy, an enlarged heart, as well as severe coronary artery disease. His death was the result of chronic weakening of the heart muscle — basically meaning his heart couldn't pump blood as well as a healthy heart. 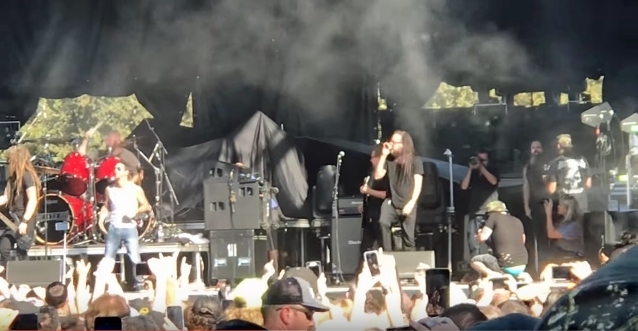 Vinnie Paul was buried on June 30 next to his brother, PANTERA guitarist "Dimebag" Darrell Abbott, and their mother, Carolyn, at Moore Memorial Gardens cemetery in Arlington, Texas. He was laid to rest in a custom "Kiss Kasket" provided by KISS members Gene Simmons and Paul Stanley. The casket was offered as a gift at Vinnie's family's request. Vinnie was also buried in some of his trademark clothes, including his hat, shoes and flannel. According to TMZ, Vinnie Paul left the bulk of his estate to to his best friend and longtime girlfriend; Charles Jones will get 38% while Chelsey Yeager will walk away with 37%. The rest is split between Vinnie's tour manager (10%), drum tech (5%), producer (5%) and friend (5%). In addition, Vinnie is giving his interest in Dimebag's estate to the guitarist's longtime girlfriend, Rita Haney.